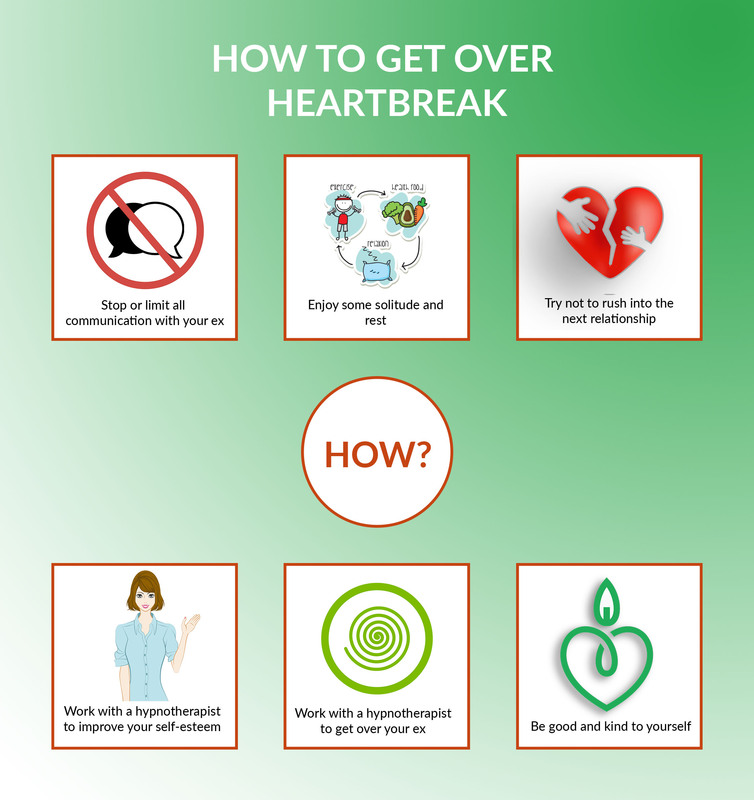 If you’re dealing with heartbreak over a failed marriage or relationship, hypnotherapy is an excellent tool to help you process your feelings, get rid of the unwanted baggage and move on with your life. It’s especially helpful if you still have feelings for your ex and you keep going back to them even though you know it’s a bad idea. When you split with someone you have been for a long time (or even a short time), it can be really hard to see the forest for the trees. Then you probably need my help to move on. If your ex still wants to be friends that makes things even more confusing. You may find yourself misinterpreting their gestures of friendship as an indication that they want to get back together. And if that’s something you want you’re probably in a world of pain and vulnerable to being manipulated. The best medicine is time away from your ex-partner. This is impossible when you have kids together – but if you don’t have kids, take this opportunity to be alone and process your feelings without the added pressure of having to see your ex all the time. Even if you are forced to maintain contact due to kids, there are many ways hypnosis can help you to handle this contact in a positive and constructive way without going crazy. If your relationship is on-again off-again, you’ve probably run the gamut a few times, breaking up and getting back together. When you’re alone at night and feeling sad you can have a temporary moment of madness where you see your ex through rose coloured glasses. A qualified hypnotherapist can help you let go of the beliefs that keep you stuck in a relationship that is not fulfilling you, and prevent you from making the same mistakes in your next relationship. Read more about how hypnotherapy works here. Help you let go of the beliefs that keep you attracting the wrong kind of partner and repeating old patterns of behaviour. Breanna had a pattern with her partner where he would leave her but still want to stay in contact as friends. Breanna was still in love with him and he used this to his advantage. He didn’t want Breanna for himself, but he sure didn’t want anybody else to have her either. So she would do her best to get over him, and just when she was starting to heal he would lob back into her life and tell her he couldn’t live without her. This cycle of behaviour went on for many years until Breanna came to see me. I discovered that Breanna had very low self-esteem and didn’t really believe she deserved any better than this guy. But hypnosis changed all that. We worked together to develop strategies that allowed her to let go of this person for good; and now Breanna is happily married to someone else. If you’re dealing with heartbreak and don’t know where to turn, I can help. I have assisted hundreds of people to move on from unhappy relationships and go on to enjoy loving long-term relationships. Call or email me via my contact page if you would like to book an appointment.